With the debut of the Jil Sander fall/winter 2015 collection for men, my paintings’ motifs have made their transformation from stretched canvas to wearable art. I could not be more excited! The Jil Sander design team, led by creative director Rodolfo Paglialunga, has brilliantly reimagined my work for pieces in their sportswear and casual range. I’m therefore exceedingly proud to report that the central motif of my Ocxiom series has been selected by the Jil Sander design team for the men’s sportswear and casual line, and also its fall/winter 2015 collection for women. The central motif of my Ocxiom series of paintings (Ocxiom 2 at bottom right) has been reimagined by Jil Sander in women’s fashions for fall/winter 2015. Ocxiom makes its energetic mark this fall in both a navy-and-crimson pullover for women and an A-line skirt. The pullover is a counterpart to a monochromatic men’s sweater. The skirt, meanwhile, alludes to the “ground,” or negative space, of its corollary on canvas. The colors, textures, combinations, cuts, and contours of fashion have long played a huge part in my aesthetic imaginings. It’s therefore thrilling to have this opportunity to collaborate with Jil Sander and to contribute to creating a wave of energizing, modern, and ready-to-wear looks for fall. Shop Jil Sander’s complete collection of modern looks for fall at store.jilsander.com. Through the debut of the Jil Sander fall/winter 2015 collection for men, my paintings have made a stylish transition from stretched canvas to ready-to-wear art. Every day, it seems, new examples of my collaboration with the Milan fashion house are surfacing online. The experience of watching the collection unfold has been, to put it mildly, utterly thrilling. Some of the newest examples of our art-meets-fashion partnership are now available online at Farfetch.com. The boutique O’, of Parma, Italy, is offering a series of Jil Sander T-shirts and sweatshirts that reimagine my 2011 painting For Never, an Ever, shown below. Several new pieces in Jil Sander’s Fall/Winter 2015 menswear collection work with the cetral motif of my minimalist painting For Never, an Ever, top right. Images courtesy of farfetch.com. I absolutely love all of these pieces. Without question, my creative partners at Jil Sander have stayed true to the spirit of my work. 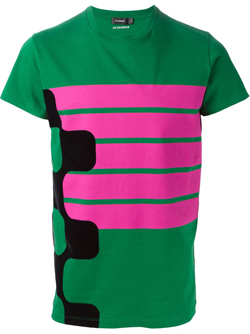 In particular, what catches my attention is the green T-shirt with fluorescent pink stripes. I love color. The bolder, the better. Since my earliest minimal works, going back to my 2003 painting Tyotk Mölxx, I have found ways to incorporate fluorescent paint into my most reductive compositions. Despite popular opinion, minimal does not need to mean monochromatic. I love this shirt. It epitomizes “The New Minimalism.” There’s clarity, with room for personality. Find it at store.jilsander.com. Since his appointment as Jil Sander’s creative lead in April 2014, Paglialunga has sought to honor his fashion house’s rich heritage of minimal cool. At the same time, he’s ushering it forward, toward future possibilities. The Jil Sander of now is still minimal, but in tune with the realities of our time. Perhaps the revolution is already underway. It’s the perfect moment to recast minimalism in new light. Let’s make that a big, bright, bold fluorescent light — one that illuminates a clear path forward toward modernity, but affords room for color and personality. Just as notions of minimalist fashion have been tied for too long to the 1990s, discussion of minimalist art has been for too long associated with what was made in the 1960s. The past is important, but let’s stay in the moment, with an eye on what’s ahead. Long live the revolution — the “New Minimalism” revolution! Milan fashion house Jil Sander has unveiled its Fall/Winter 2015 menswear collection, which features motifs from my minimalist paintings, such as Ocxiom 2, shown at right. 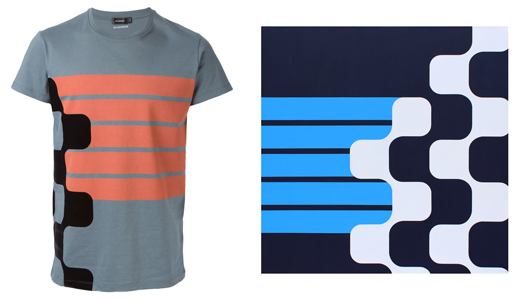 Eye-catching contrasts, monochromatic motion, angles and stripes: My minimal paintings’ motifs have made the transition from wall art to wearable art. Global fashion house Jil Sander has just unveiled its Fall/Winter 2015 collection for men, a major event that marks my artwork’s debut in designer fashion. In January, after my trip to Milan Men’s Fashion Week, I announced that graphic inspirations from my minimal paintings would have a bold presence in Jil Sander’s looks for fall. This week the initial results of our creative partnership are arriving in the world’s finest stores, including store.jilsander.com. My Ocxiom series of paintings takes to the streets in a crewneck wool-and-silk pullover. 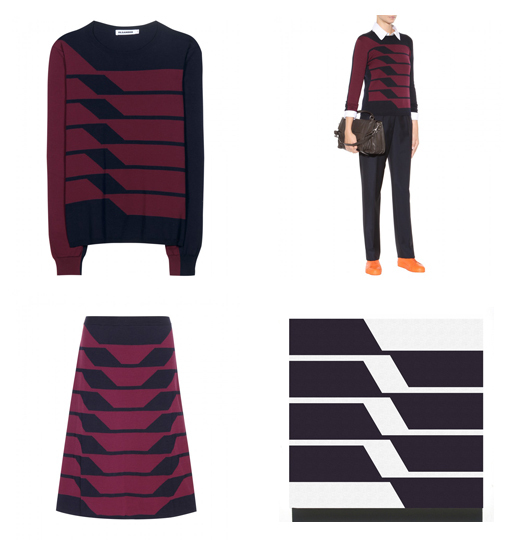 While the sweater is a vertical composition and my painting is square, the sweater employs a greater number of slanted stripes, matching the painting’s all-over composition. The design continues along the sweater’s sleeves, achieving an eye-catching contrast. 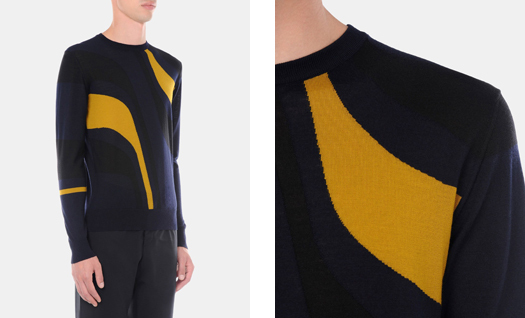 Featuring the motif of my Ocxiom series, this Jil Sander pullover is an 80% wool and 20% silk blend. Details at store.jilsander.com. I’m inspired to see how my work has been reimagined by the Jil Sander design team, led by creative director Rodolfo Paglialunga. Throughout the transition from painted canvas to artistic attire, my creative partners have stayed true to the spirit of my work. 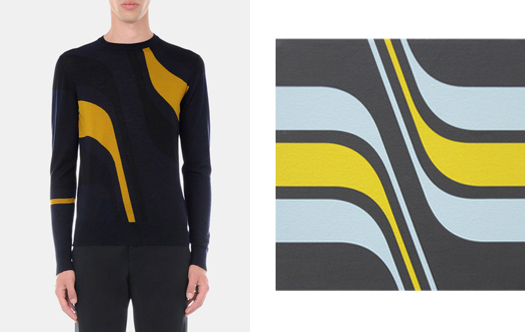 In another design, my Motus series of hard-edge paintings — motus is Latin for “motion” — brings energy and fluidity to a merino wool pullover, which features intarsia interplay in navy, gold, and black. I have long believed that my paintings could have a “parallel life” in fashion. It is an honor that Jil Sander — such an esteemed and innovative fashion house — is making that imagined life a reality. The next few weeks should prove tremendously exciting! I recently had the profound pleasure of traveling to Milan as a guest of luxury fashion house Jil Sander, to view its Fall / Winter 2015 men’s collection — from a front-row seat. Graphic motifs from several of my minimal paintings will have a presence in the sportswear and casual range of Jil Sander’s fall collection for men, which will be available in some of the world’s finest stores starting in September. What’s more, invitations to the runway show featured a reimagined version of my minimal, 70s-inspired painting Blactan. Above: The study for my 2007 painting Blactan among invitations to the runway show for Jil Sander’s Fall / Winter 2015 men’s runway show, held January 17, 2015, as a part of Milan Men’s Fashion Week. 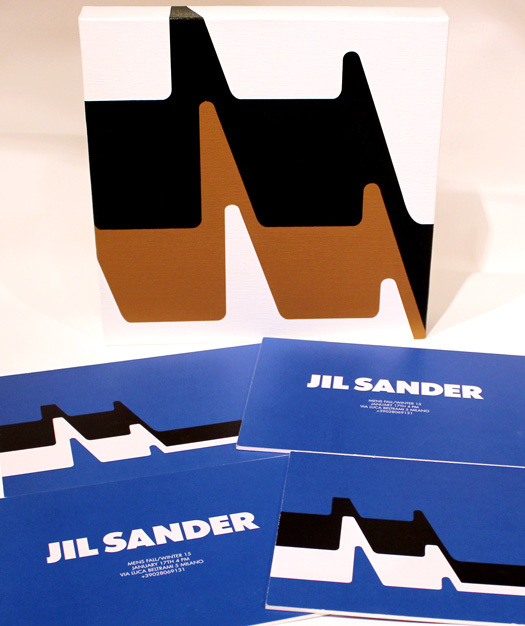 I was contacted by Jil Sander in December, out of the blue, to my great surprise. Quite simply, the brand’s design team had found my work online, and wished to license selections from my catalogue. Naturally, I didn’t say no. All the same, I have said “thank you” to the Internet a few times. Nearly 6,000 miles (9400 km) separate my studio in Tempe, Arizona and Milan. Traveling between the two points takes nearly one full day. But it’s particularly fascinating to me that, despite this distance, my work might resonate with, and possibly inspire, a highly accomplished designer and his team — one that’s virtually on the other side of the world from where I paint. The world is even smaller than I once imagined. I have long believed that my paintings could have a parallel life in fashion. Friends and family have asked me this repeatedly, “Why don’t you make clothes? Your paintings would look fantastic on shirts!” However, I never imagined that a global luxury brand like Jil Sander would get the process started before me. Led by creative director Rodolfo Paglialunga, Jil Sander’s fall/winter 2015 runway collection for men was impeccably presented. I was immensely impressed by the overcoats, which balanced angularity and structure with luxuriousness and comfort. I can also appreciate how the collection’s palette was accented by punches of bold hues, such as vivid red-orange, which blazed down the runway more than once. It was a thrill to have the opportunity to meet Jil Sander staff in person. The fashion house has been perfectly generous with me. Once images of garments featuring my work become available, I will certainly share them with you in this space. There’s more to come this fall. 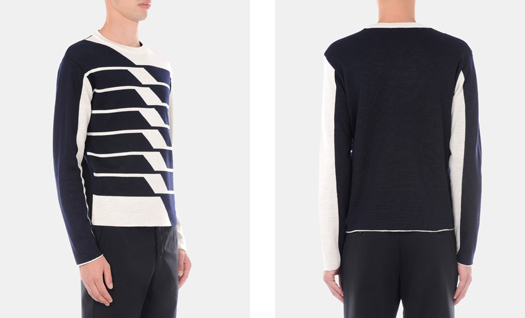 No excuses — there’s plenty of time to set aside some of your wardrobe budget for a Jil Sander / Grant Wiggins sweater! Until next time, ciao ciaoooo! The Autumn Winter 09/10 collection of Eley Kishimoto absolutely amazes me. I am transfixed by the collection’s graphic patterns and wild color combinations — and the way patterns and colors are remixed from one piece to the next! See the full Eley-Kishimoto collection at eley-kishimoto.com. I find Eley Kishimoto’s work completely inspiring. Their work has renewed my interest in making so-called “maximal” paintings, like my abstract art painting Ultraam Aeterrix.